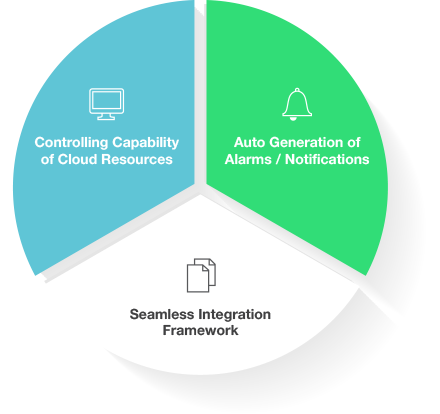 Jamcracker Cloud Management Platform is a comprehensive cloud services broker, cloud governance and cloud services management platform which enables organizations to create, deliver, and manage multi-cloud services. 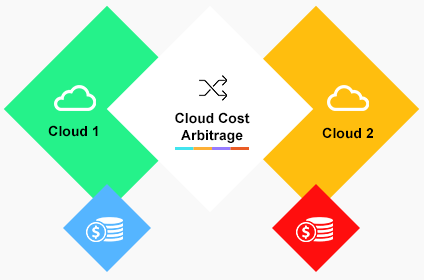 The platform helps organizations to implement a cloud-enabled business model for offering, delivering, supporting and billing of multi-cloud services. Jamcracker Cloud Management Platform provides control of user access rights across the platform and offers privileges across applications, and private and public clouds. Multiple roles through a single view. Provides restricted access to various functions. Define roles at multiple levels for complete administrative flexibility. Granular control of access to functionality. Roles can be inherited from external directories or defined within the platform. Monetize your process, integrate with critical applications and account and charge for cloud services used. Utilization can be billed based on subscription or usage. 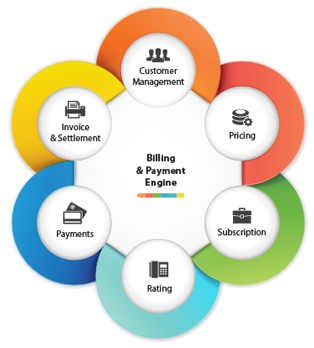 Reconciles payments against invoices and triggers collection processes. Capabilities to interface with various payment channels in real time. Integrates with external billing systems. Supports metered usage, one-time fees, tiers, and other pricing models. Run charge-back/show-back reports manually or automatically. Receives real-time billing data from all major cloud providers. Supports one or more external tax engines and helps define the tax. Supports volume discounts, tier-based increases, and/or thresholds and groupings you define at the product, package, market segment or individual customer level. Provides self-service provisioning of users and services. The platform helps streamline account setup, synchronizing of user attributes, and self-service access requests. Efficient tracking of service licenses. Policy-based provisioning and de-provisioning of resources. Centralize management and provisioning control. Leverage on-premises, cloud, and hybrid directories to enforce identity-based policies throughout the app lifecycle. 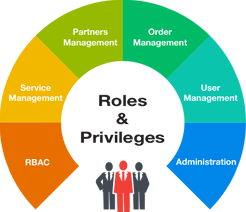 Delegate user and service administration to lower tiers and/or special Roles. Accesses policies proactively and detects violations in your cloud management environment. Makes use of point-and-click interface to easily define access policies for Businesses and IT managers. LDAP & SAML as the identity provider for user authentication and authorization. 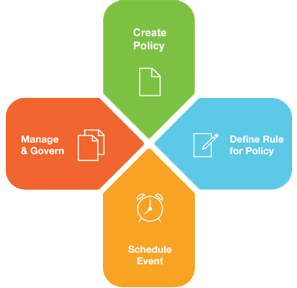 Manage and govern cloud services using the Jamcracker Cloud Management Platform's policy framework. Manage critical business processes and automate tasks using defined rules. Supports policy creation for managing and monitoring compute products, and facilitates capacity/resource planning. 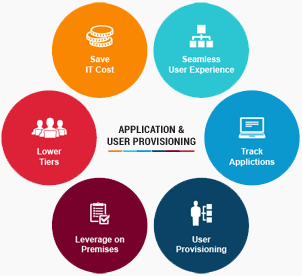 Supports policy creation for users, service provisioning, SLAs, security related policies, billing/chargeback policies, etc. Enhances Cloud Spend Management for cloud services by letting IT track every expense from beginning to end, including IT costing, chargeback, and showback. Visibility into cloud usage vs. budget. Cost analytics dashboards provide granular view of cloud usage. Cost-tracking capability to estimate future trends. The budgeting system can set usage thresholds and send alerts. 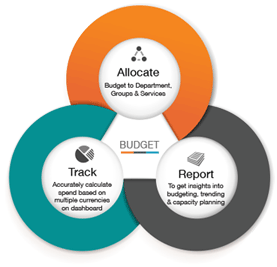 Allow flexible cloud services budgeting and track utilization. Integrate with financial systems for additional governance. Offers a multi-tiered content management system based catalog with the flexibility to onboard and aggregate wide-ranging cloud services (SaaS, PaaS, and IaaS). It also provides you with the ability to customize the branding of the marketplace. Define, create, and publish IT services and service bundles. Service catalogs to support self-service provisioning. Publish content for various services. Define service costs and pricing. Supports subscription, metered usage, one-time fee, and other pricing models. Allow users to compare, order, manage, access, and track usage of cloud resources from a single catalog, from multiple cloud service providers. Standardize how services are ordered and delivered, thereby reducing time consuming processes. Provides comprehensive solution for all forms of reporting needs and enhances the ability to build, generate and save own reports. Build once and share the report templates to multiple users. Abstraction and consolidation of reporting data from heterogeneous live data sources. Data level RBAC to hide sensitive data by providing better security. Isolate and secure live business data at reporting layer with "read only" access. Encrypt or mask sensitive data rendered to reports. Audit report usage patterns and data accessed and track reports created, modified, viewed and deleted. 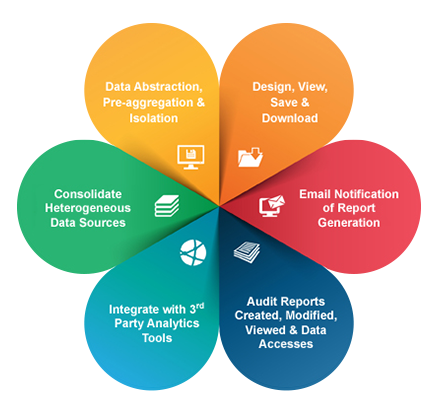 Integration and Flexibility - Easy integration with 3rd party reporting tools like Tableau, Pentaho, Jasper, SiSense etc. Simplify data access for external integration such as billing, budget feeds etc. Flexibility to configure large reports for email notification to download and view offline. Continuous monitoring of virtual machines which helps identify problems before they arise. Captures information such as CPU and RAM utilization, physical memory usage, network bandwidth I/O utilization, disk I/O utilization, and more. Monitoring information supports root-cause analysis, bringing controlling and preventative maintenance capability of cloud resources. Rules-based alarms/notifications for usage thresholds and monitoring parameters. Seamless integration with other monitoring applications. Extensive dashboards for complete visibility and control over performance, availability, and capacity utilization. Visibility into the organization's cloud usage and configurable widgets that display granular views. Multi-level cost-tracking capability provides current and historical usage data to estimate cost trends. Real time inventory of IaaS resources from various cloud providers. Extensive cost and tag analytics dashboards. 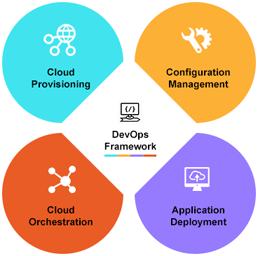 Orchestration framework supporting multiple clouds and help in the transformation of IT departments into a self-service organization. Automate, configure, and provision cloud resources from any cloud with just a few clicks. Automates the deployment and management of infrastructure services and applications across public, private, and hybrid cloud environments. Deliver infrastructure services faster, by managing resource usage, availability, scalability, performance, and more. Orchestrate multi-cloud infrastructure services such as compute, storage, load balancers, firewall, networking, etc. Simplify, automate, and optimize service deployment by accelerating delivery of cloud capabilities across various environments and infrastructures. Manage virtual-machine sprawl, using policies to automate high-scale provisioning and de-provisioning of resources. Greater efficiency, control, and scalability, by designing, launching, and managing cloud workloads (AppStacks) through a single drag-and-drop GUI. Track cloud services usage from various cloud providers. Jamcracker Cloud Management Platform helps to identify, analyze, plan and track cloud migration. Data center insights like summary of resources, VM distribution, CPU and memory utilization, VM count by CPU, cost trend etc. 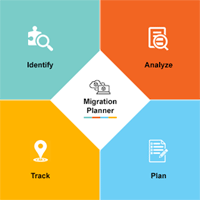 Mark the resources for migration and track the progress with the help of tags. Insights into private and public cloud usage and cost side by side. 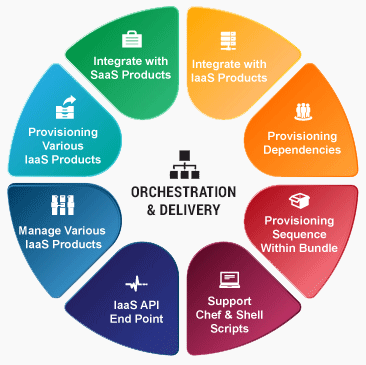 Accelerates IT Automation by automating cloud provisioning, configuration management, application deployment, intra-service orchestration, and many other IT needs. Efficiently run required scripts present within the platform and launch resources within seconds. Complements the existing IaaS features in the platform. Eradicates the necessity to on-board varied resources of diversified public cloud providers on the platform. Integrated with Ansible at present and other popular configuration management tools to follow. 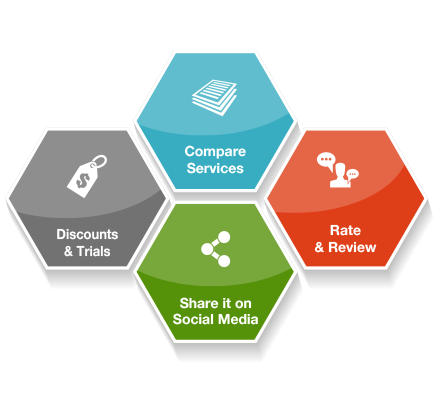 Compares various cloud providers and helps get a cost comparison of their offers instantly. Cloud VM comparison - Choose the desired VM configuration and instantly get a cost comparison of various public providers’ offerings. Compare databases, load balancers and other cloud resources to easily compare the prices. Create wish list and compare estimated price for the whole stack across providers.